Are Heat Activated Hair Products Right for your Hair? Home > Hair Products > Are Heat Activated Hair Products Right for your Hair? 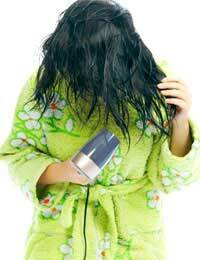 If you can't live without your hair dryer, curling iron, flat iron, or hot rollers each morning then you may be doing unknown damage to your hair. The intense heat supplied by these styling agents to curl, straighten, or fluff your hair is actually very damaging to the shaft and cuticle of the hair strand. To avoid further damage, which can lead to breakage, split-ends, brittleness, and even premature hair loss, it is best to cut down or eliminate the use of these tools. However, if you must dry, press, and flip your locks each morning then you may need a heat-activated hair product. What Are Heat-Activated Hair Products? Heat-activated hair products are products that contain special ingredients or formulations that protect the hair shaft from high temperatures and boost the effectiveness of the styling tool so you can shorten the time required to get results. Heat-activated hair products include special shampoos, conditioners, styling gels, hair sprays, and mousse. These products usually contain more moisturising and hydrating properties than regular products and work by coating the individual hair strands to add a layer of heat protection and lubrication between the hair shaft and the heat source. How Do Heat-Activated Hair Products Work? Heat-activated hair products coat the hair strand with a lubricant that shields the hair shaft from intense heat. This protective layer helps reduce the amount of heat damage, strand weakening, and drying that occurs. The lubricant also makes hair slippery, which helps the hair slide away from the heat source and reduces damage from tugging, pulling, and grabbing. In certain types of heat-activated products, such as leave in conditioners or spay on styling agents, the ingredients in the product are actually activated by the heat source. This means that the active ingredients, such as oils, warm-up or melt when exposed to heat to better coat or cling to hair strands. Once activated, these products also protect the hair strand from high temperatures and lubricate the hair. These products also usually contain an ingredient to help hold styles in place, which kicks in when heated. Are Heat-Activated Products Right for Your Hair? If you frequently style your hair with heated tools you can probably benefit from the use of a heat-activated product. Since these tools can be drying and the continued exposure to high heat can breakdown the keratin in hair strands, you will want to use some sort of protective agent. Although any high-quality leave in conditioner or styling spray will offer some form of protection, a heat-activated agent will contain all of the ingredients you need for healthier, stronger hair. However, if your hair is fine, oily, or curly then these products may not be right for you. The heavier formulation of these products can weigh down hair strands leading to limp looking locks, flat curls, and dull looking hair strands. Plus, the lubricating action of these products can make oily hair worse thus robbing your style of beauty. Before buying a heat-activated hair product check the ingredients list and compare it to your usual hair products. If it contains more moisturising ingredients, heavier oils, or a heat-activated lubricant you should give it a try and see how it works with your hair.